I just made it to my comfy double-wide chair in my bedroom. Sweat pouring off my body! I just got stuck in between some boxes and a wall on my trike! Oh let me fill you in...Cause I'm in the mood! This Air Conditioner saga just gets more and more involved and complicated. Little did I know that a single, 2 year old A/C unit that leaked into the house could cause so much trauma, drama, damage and frustration! I'm really laughing here as I write this...and I don't know why! Bahahaha! The leak from the A/C line where you flush it with bleach is the culprit. Backed up and I guess flooded under the wooden floors, the baseboards and some of the sheetrock. The adjuster came and the damage is thousands of dollars. And we aren't talking 5, 10 or 15 thousand....much more! Good Lawd!! 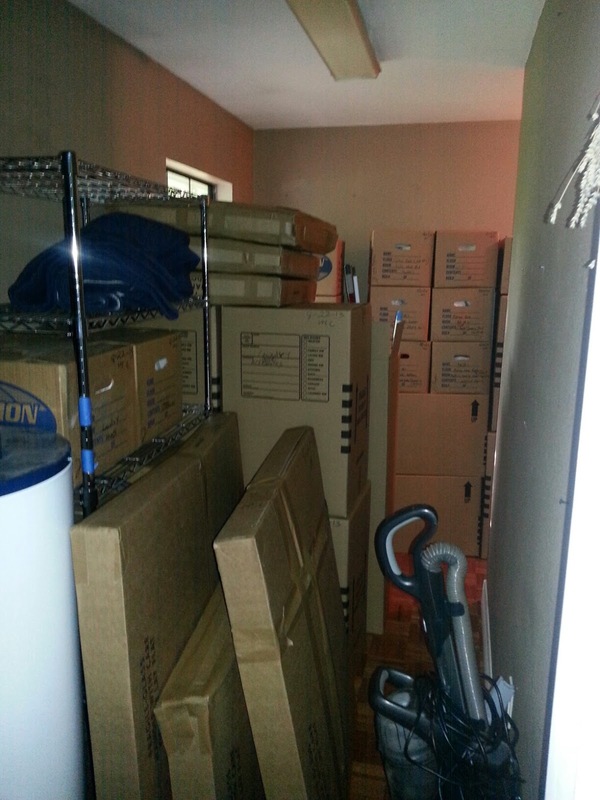 Well friends, we've had the folks out for the water damage, the insurance adjuster, the flooring people and today the packers who just started packing up everything....The boxes...glad you asked....They are everywhere living room, washroom and HALLWAY!! !....This is just the beginning. They will be back tomorrow to pack up my beloved studio....(More about that later)...the kitchen and the living room. Then I understand there will be a delivery of storage pods perched on the lawn in which the furniture movers will come and move out all the furniture and boxes....Then the work will be done on any sheet rock that needs to be replaced...and then....the floor people will come to replace the floors! Good Lawd Again! Me? Glad you asked...All I want to do is be able to trike my way around to just survive and not break anything left on my bod that still is in one piece LOL!....Visualize an older balding dude navigating through 1/2-inch utility cords, fans, blowers, dehumidifiers and now scores of boxes on his trike, leg somewhere following behind safely in tow. The moving and packing up of every single thing in my studio has sent me into a tail spin! 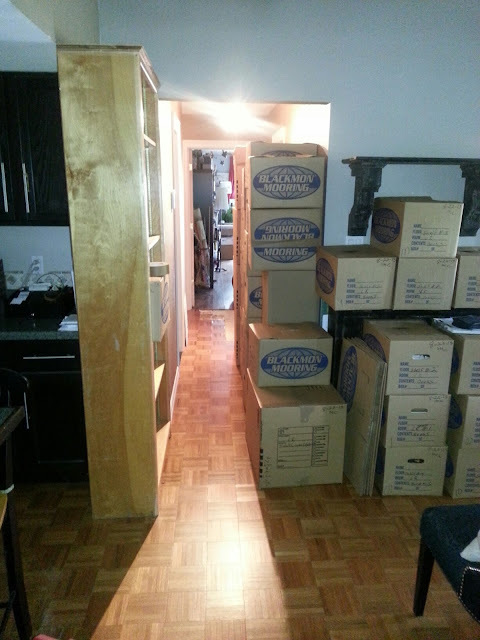 As I said above, the hallway has about 18-inches to navigate through because of the boxes. Yes indeed I got my trike stuck with no one around to hear and see the fancy foot work and words I'm not proud to mention here. Now, I'm triking through the front yard in my NOT so all terrain trike to get to the studio to grab essentials before they are packed away and "podded!" What do I grab? What will I need to survive this...this...challenge? I better trike back through the yard to the studio to grab chipboard, Scor-tape, Idea-ology, trimmers, cutters, bone folders and more! Oh no! Sounds really serious. Sure is a lot of moolah, too! Hang in there, Jimbo! Wow Jim! when it rains, it POURS...in your case literally!! Can you get a stair climbing trike?? I can carve you out some space in my studio for you to work! Thinking of you! Oh, no! Jim, I'm so sorry. Hang tough, my friend. Oh no! Hang in there. Don't forget to grab the Xyron and your Dylusions. Hopefully they will work quickly so things can get back to normal. OH NO!!! How in the world can this be happening!!!??? You poor thing... I have no words... that is certainly a mess ya got going on there!!!! At least you can still blog all the going ons to keep us entertained... er... informed, about the remodel progress!!! OH me oh My! When it rains it pours! So sorry to hear this! Just be grateful you have insurance to cover the damage and someone that is coming in to pack, move, store and fix all the problems. Bless y'all's hearts! I hope it doesn't take them long to fix things and get y'all moved back in your home and studio! My thoughts and prayers are with you! Ink... don't let them pack your ink... it will dry up in the hot pod in TX. Your up-side-down world does not sound fun. Hope all the workmen will make fast work of the repairs. Maybe now would be a good time to go on vacation. Or, check into a hotel. Hire someone to oversee the work in your house and hit the road. You don't need the added stress and inconvenience. I really feel for you. Hey, is there a pizza shop that delivers to your address? I wanted to send you a "pizza" gift but couldn't find a shop that was near you.....just sayin. You poor guy! So much going on with you this summer, wish I lived closer to help you out. Jeez, Louise! What a mess. Sending hugs to you and Cesar! OMG you poor fellow crafter, this is really a major disaster. Hope your foot heels quickly so you can maneuver better and get those guys rolling so you can get back in your space! Oh my goodness. Who would have thought it caused that much damage. It certainly didn't look that severe. At least they are packing it for you. Not fun at all! Thank God for insurance!!! I so glad you guys aren't trying to do all this work yourselves!! La mia casa è la tua casa...translated...my house is your house. You guys are welcome to come over anytime if you need to get out of the mess for a while. Gosh, this sounds horrendous! And as for any laughter, I'd say hysterical,bahahaha! Jim, if you need to stay someplace, you and Cesar and the animals are welcome here. We have an extra little house and a huge fenced yard. Not fancy but you will be welcome. The commute might be a little longer than you want, but just want to extend the invitation. Or if there is any other way I can help you, let me know. Oh dear - poor you (and Cesar)! What a good job you were insured though. These things are sent to try us. I hope it all gets sorted out really quickly and you can get back to triking around to your heart's content! At least you have a lovely trip to Italy to look forward too. This may not be funny but I have a good grin on my face. I guess this could happen to any of us. Please keep us posted on the progress. You hang in there!!! Good afternoon Jim from "across the pond". My, you really are having a tough time lately and do so hope that everything will be back to normal (whatever that is!) very soon. Do hope your recovery is progressing well - hang in there kiddo! I feel your pain, sort of. We're in week six of a kitchen gut and redo and the other rooms in our home look a lot like your pictures. I had a mini meltdown yesterday about the mess and disorganization, including preparing meals with only a hot plate and crock pot. But we have at least three more weeks to get through, so I must pull it together. I recommend thinking about how clean your home will be after and the opportunity to reorganize and purge your studio or, in my case, the kitchen. Those thoughts are the only things keeping me sane. Best wishes! Holy crow, Jim. This is unbelievable. What a nightmare. I absolutely LOVE your attitude though. You gotta laugh. What's the alternative? Maybe this is a sign that you should take a break and relax. Let it go for bit? If you're anything like me, though, this is probably out of the question. Just keep smiling honey, and things will get better. And think how nice a new floor will be. Big hugs!! How awful! Packing up my studio would put me in a tail spin too. Vacation sounds good right now. When it's time to unpack and set up your studio again just think of all the things you will find that you forgot you had!! Take care and just laugh! Good grief Aunt Maudie! I think you better fly up and stay with me Jim. I am sure we could get ourselves into some papercrafting paradise. What a holy nightmare. Just grin and bear it as they say and......thank the Lawd for insurance! Hang tight. Wow Jim, I feel your pain. I just went through something similar...not fun. Only I have ceramic tile on the floor. Those dehumidifiers and fans just about drove me crazy. But at least a had two good feet to navigate through the mess. We're still muddling through. I hope everything goes smoothly for you. Oh Jim, I am so very sorry you are having to go through all of this, especially with a broken ankle. It's just not fair. I know where you are coming from though! Our media room, downstairs, flooded four years ago, and it was an awful, awful mess. Fortunately for us we did not have to move everything out. So much for window wells with drains and sump pumps...........when the electricity goes off, those pumps don't work. Apparently no one thought about that when building our home, we sure didn't. Be save, try and stay calm and "this to shall pass"
So sorry you're going through this Jim and Cesar! But so glad insurance is covering it!!!! Like many others said, just hang in there and try to keep your sanity, it will all work out! I am so sorry that you are facing such extreme challenges. You will be in my thoughts and prayers for a speedy recovery for both you and your home. OHHHH...so sorry, I had a flood in my basement a couple years ago, my craft room and my office was involved,so I know what this is...however when it is finished it will be all new and great. Hang in there, go on a mini vacation... Thinking of you and Cesar. I hope this is a quick process, and very happy that your sense of humor is intact. Oh no Jim... I am feeling your pain! That is horrible... and then on top of it you can't get around in your own home! The stress of trying to grab all of the things out of your studio that NEED! Yikes, I would be pulling my hair out and I an not on a trike! Will be around this weekend to see how you fair!!! Hugs and Hope it all goes quickly and smoothly!!! So sorry to hear of your trouble (as I try not to laugh too hard). Though my day is looking better by the minute which is saying something. I hope that they dry, repair, replace, unpack and roll you back in soon. At least you still have your sense of humor and score-tape. Jim, I don't what to say. I'm so sorry that this is happening & I cannot imagine how chaotic it must be. I hope that everything gets repaired as soon as possible & you're back to normal. Take care, big hugs. Stay strong, Jim! You are, and this too will pass. It is amazing what water can do. I am currently searching for a roofer, as I am getting water in my porch. Ugh. 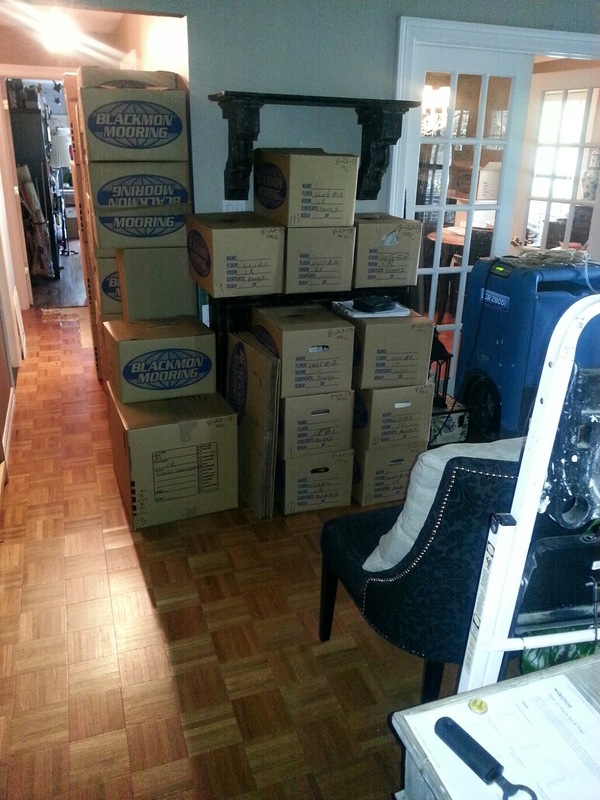 The packing up of all my kitchen pots and appliance out there will take me awhile for sure. Hope you enjoy some time with your stuff and spend some down time.. Rest that ankle! Jim, I am sorry you are going through all of this, I just saw your grab list. Don't forget your scoreboard and glossy accents :) Get well soon! Well, you are a Texan...so you go big, right? Wow! I hope all is fixed and put back together quickly. I am not sure if I should send you chocolate, alcohol, hugs, or what! All three?? Oh, dear--do you still get to sleep in your home? It sounds like a real mess! I hope the A/C was still under warranty--but not likely, I guess! Please don't suffer too many withdrawal symptoms about your craft supplies! All will be well again in the fullness of time! Good God! How long has the thing been leaking!? To do that much damage it must be for some time. I'm so sorry! Don't let them pack your dry adhesives either! The heat does something to it. Good luck with the reorganizing when they are done. Have fun! Geez!!! Total disaster - at least it's happening at the same time and you'll get through it faster. Losing your studio is a cruel blow. I think it's a great excuse to go out supply shopping, esp. with the new stuff coming out or learning how to knit from Cesar. How is Cesar doing - I hope his work has settled down, at least. Personally, I hate anything to do with plumbing and am in awe of plumbers. I can't wait for the next update. Jim, before you kill yourself or do more bodily harm, why don't you let them pack away even your studio and take a well deserved break from everything until this gets taken care of. Have they given you an estimated completion date? Maybe you can ask them if the studio could be first on their list to complete. You know with your broken ankle, you really should be sitting with it elevated as much as possible to allow it to heal properly!!!!! I am sure Cesar would help to pack up the studio's most needed things in some plastic containers that could be made readily available on a whim!!!!!! Lol. If you don't sit still you are not going to heal enough to make your trip to Italy. Please be careful and take care of that ankle. repaired.. how long and where do you and Cesar go ?? I take it -- no Tuesday show this coming week ?? WOW>>>>furniture/boxes on the lawn? wwwoooo....so will these get vandalized at night? I wouldn't like that part, as well, looks a little too squashed for me likin'; can feel a tightness & panic feeling goin' on, w/a whole lot of little spaces........hats of to you; you make me smile every day! Holy Scrap!! Poor you! I can just imagine the words coming out of my mouth if that were to be me...Poor, poor you! I guess I should thank my lucky stars that my hubby can fix damages like this...Poor you! BUT you will have beautiful floors, and everything will settle nicely in a few ...weeks?...Chin up, Jim! Holy mackerel! Let's sage that house and clear out the black cloud above..... Good Lawd is right! Hoping it all gets straightened out just as soon as can be. I'm so sorry you're going through all that! OMG... Life has been getting in my way and I've been missing all my blogs ... my stars did not know you had fallen... sorry to hear that. And my goodness... you certainly are getting your share... hope all gets better for you in a timely manner! Sending you some love... I'll be back to check on you ... in the mean time do be careful :) <3! Rough times? Sounds like it... Let's get to the important stuff... How are you going to craft?